"Miracles happen every day! These 101 true stories of answered prayers and divine intervention show a higher power at work in our lives. These 101 true stories of healing, divine intervention, and answered prayers prove that miracles can happen to anyone at any time. 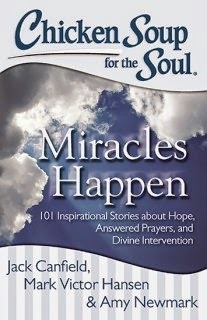 You will be awed and uplifted by these personal stories of divine intervention, healing, and faith." You can purchase this book at Barnes & Noble or on Amazon.